Dubrovnik is a well know town in Dalmatia, located almost at the very end of Croatian territories. The town stretches about 6 kilometres – starting from the west from river Rijeka Dubrovacka / Ombla in Mokosica, to the peninsula of Sveti Jakov in the east. 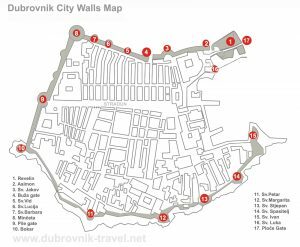 The oldest part of Dubrovnik, the Old Town is located east of Lapad at the bottom of Srd hill. It has well preserved cultural and historical heritage and is therefore inscribed on the UNESCO’s List of World Heritage Sites. Old Town’s street and squares are stone-paved while the architecture consist of elegant terraced houses, monasteries, churches, palaces, galleries and museums. Except for its historical heritage, Dubrovnik also offers good holiday opportunity in terms of sea, sun, night life, restaurants and taverns with various specialities of local as well as international cuisine. Nowadays, Dubrovnik has population of about 44 thousands.